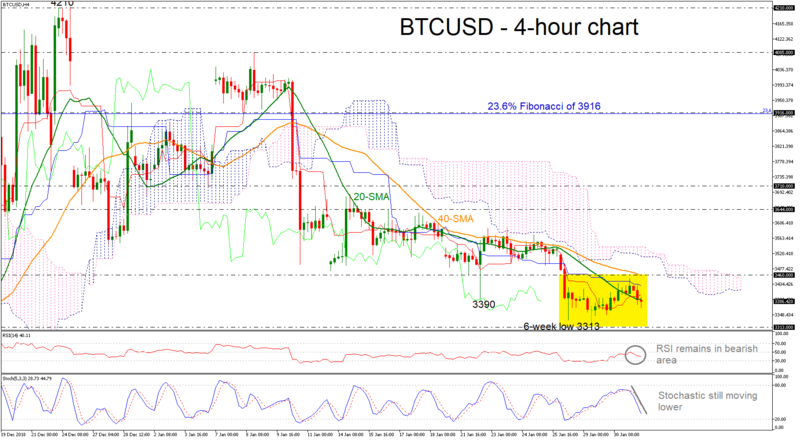 BTCUSD holds slightly below the 20-and 40- simple moving averages (SMAs) in the 4-hour chart as well as below the Tenkan- and Kijun- sen lines, suggesting further negative pressures. The RSI indicator is flattening in the negative zone, while the stochastic oscillator is approaching the oversold zone with strong momentum. Should the price stretch south, immediate support is coming from the six-week low of 3390 barrier, taken from the bottom on Tuesday. A step lower could bring the bearish sentiment back into play, hitting the 3116.50 hurdle, taken from the bottom on December 14. More losses could send price to post another lower low confirming the strong bearish sentiment. Should the price extend higher, it could find resistance at the 3460 level, which currently coincides with the 40-SMA. Also, an advance above this region would increase speculation that a bullish move is in progress towards the 3644 hurdle and further up, the 3710 area would be the next level for investors to focus on, registered on January 16. To sum up, the very short-term bias remains neutral especially as BTCUSD lies between the 3313 and 3460 levels over the last three days.